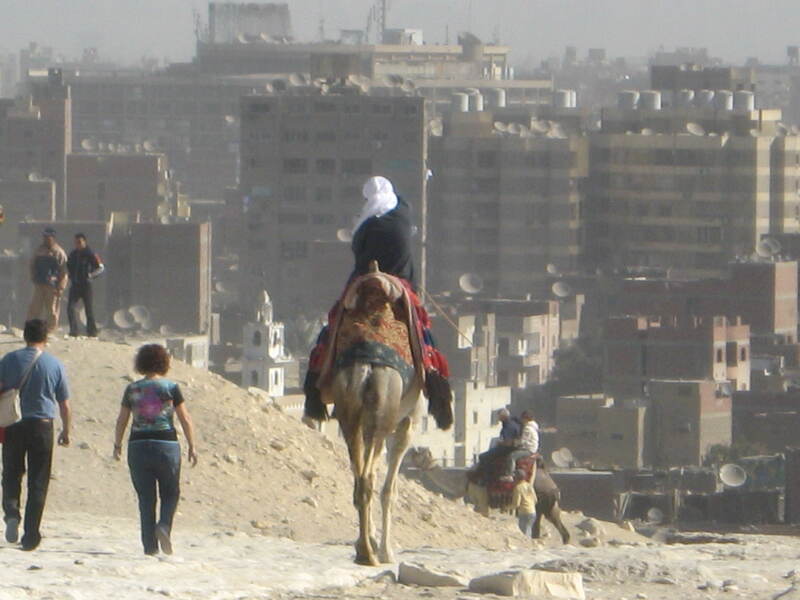 ICONIC: Giza skyline forming the backdrop for the pyramids. 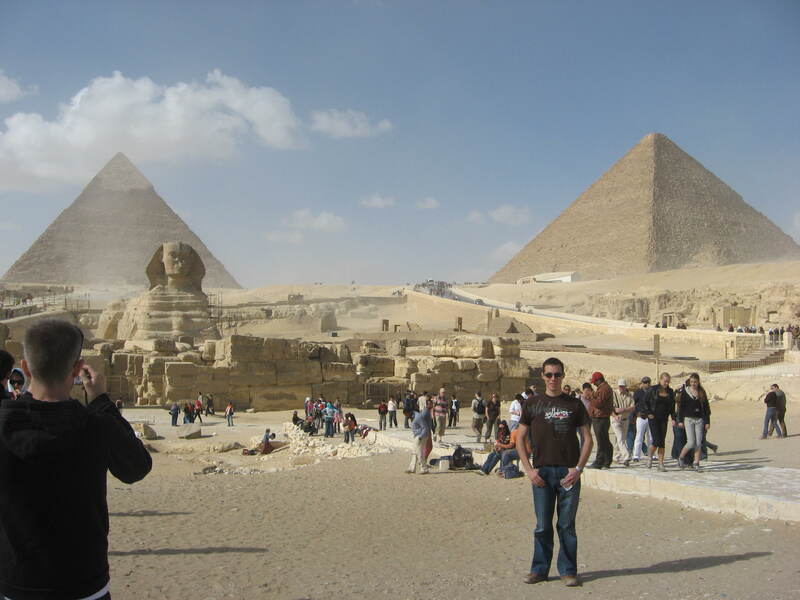 I miss Egypt. Not just Egypt actually, but the Middle East in general. 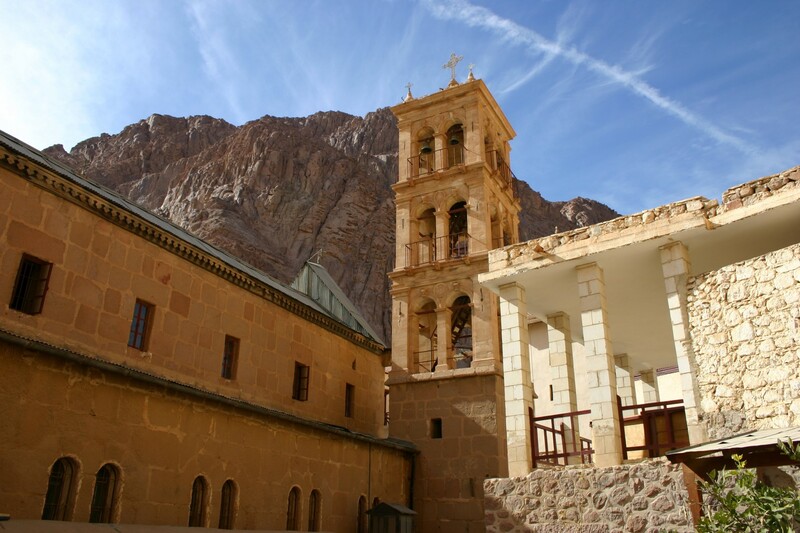 Forget the modern monoliths of Dubai and the United Arab Emirates, what I yearn for is the excitement of exploration and the thrill of being set adrift in a place where everything is unfamiliar. Perhaps it’s the subtle shift to a situation where I can track the feeling of not quite fitting in to a particular purpose, rather than just a fact of personality. I’ve felt it slowly rise in recent months and years as we’ve travelled across the world through the cities of Europe, and hopped across south Asia. The clincher, though, is that Linh is currently travelling as I sit at my desk at work seething with jealousy. 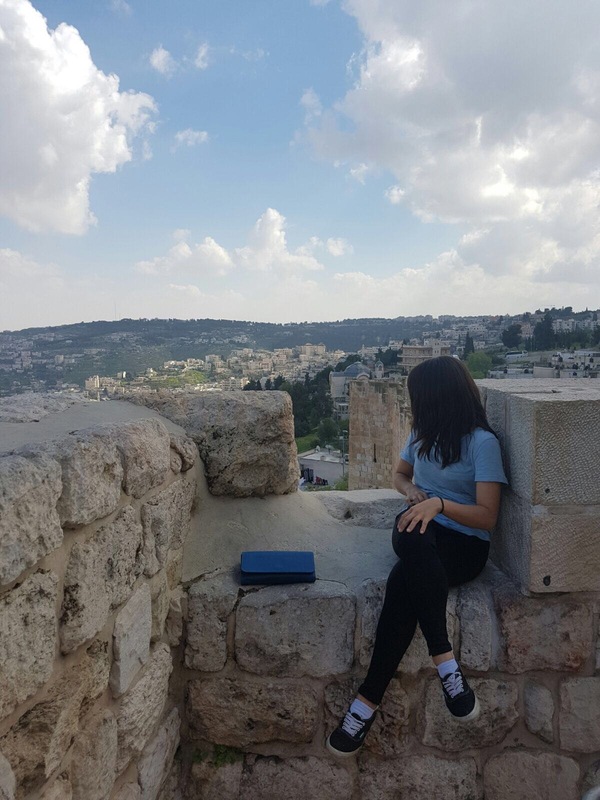 For the first time since we met, I am at home while Linh is away – and to make matters worse, she is in Palestine. MISSING OUT: Photos from Linh fueling my jealousy. It’s not that I begrudge her the trip, quite the opposite; I’ve been on at least four solo trips with work and friends since Linh’s last escape. Besides it is a close friend’s wedding that took her there. 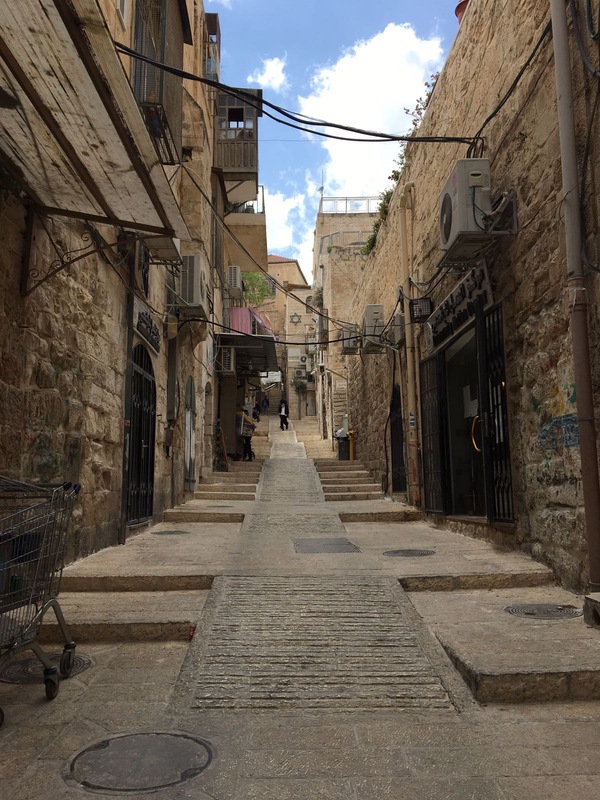 What stings for me, is to see photos of the cobbled streets and sandy tan buildings of a region that keeps calling to me, whether as a shadow of the Indiana Jones filled imaginations of my youth, or the sand blasted memories of the adventure’s I had last time I was there. We will forget, for the moment, that Linh is adding another mark on our map and moving ever further ahead in terms of countries visited, and focus instead on adventures past. 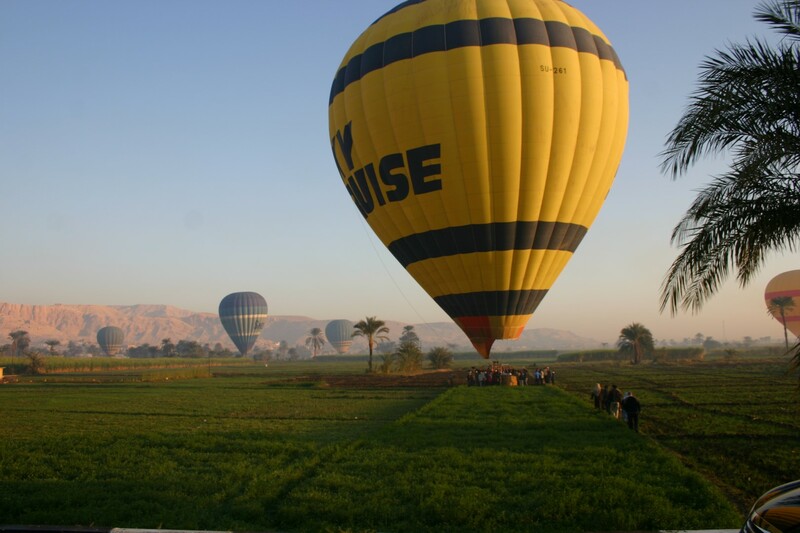 BUOYANT: Ballooning over the Valley of the Kings. 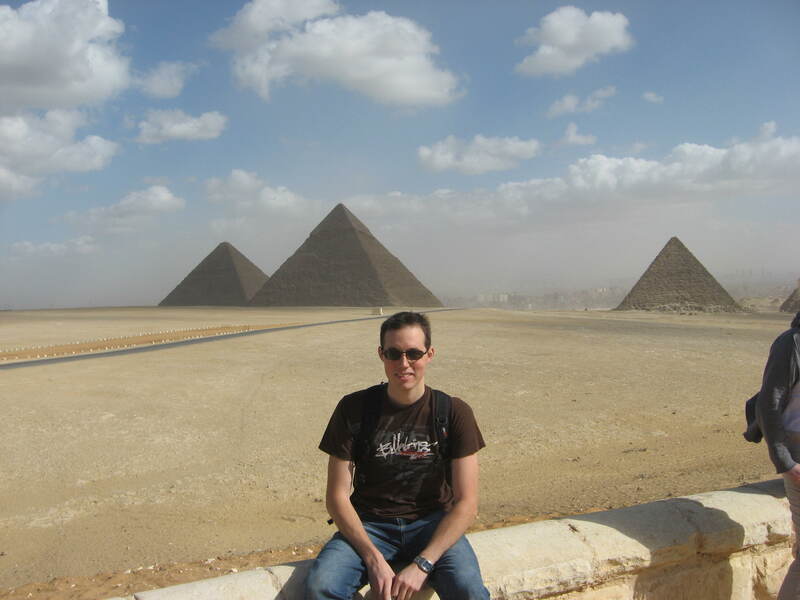 My last foray into the Middle East was in 2009, when I travelled to Egypt and Jordan via Abu Dhabi. 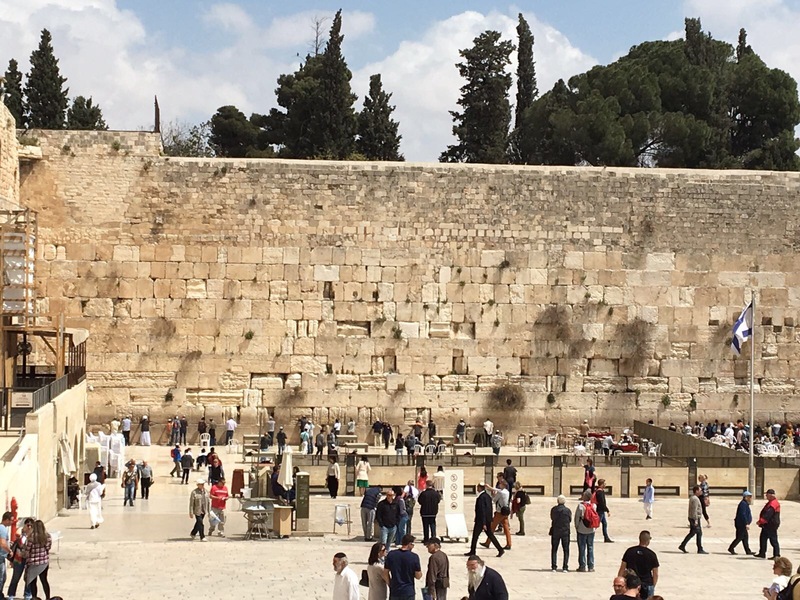 Even now, of all of my trips, this journey remains most etched in my memory. 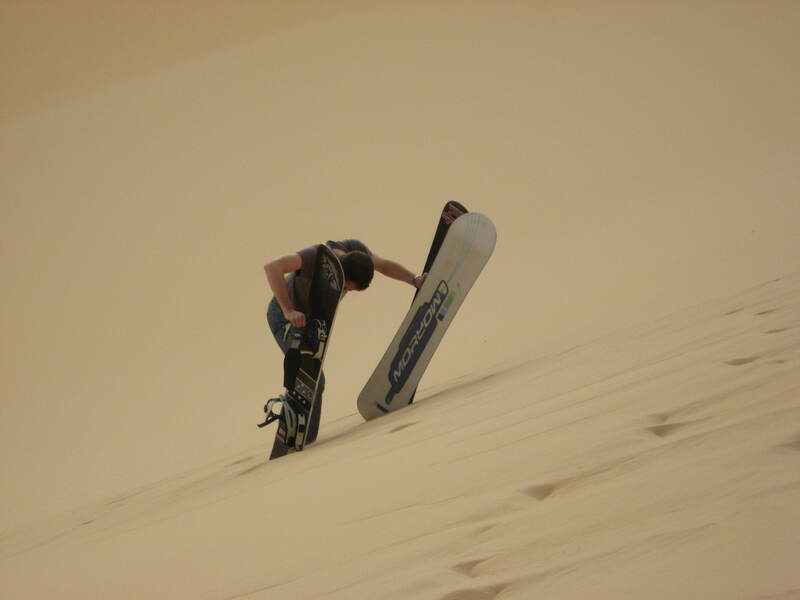 It’s not the sharp, clear vision of recent trips, but the romanticised reimagining of experiences (some unpleasant) that weaves itself into a tapestry of reminiscence that means that the next trip planning discussion will most definitely be about how much sand we can get into our packs. 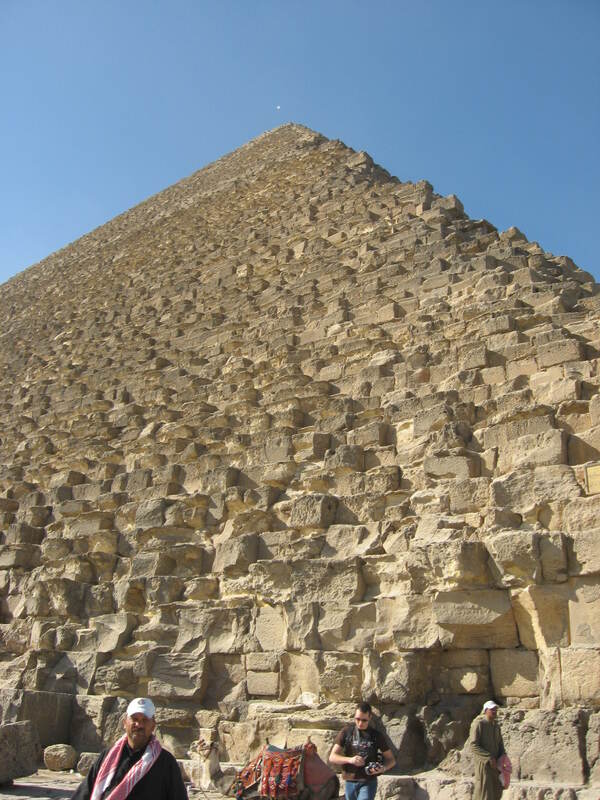 GIZA GAZING: The great pyramids are a lot closer to the city than you might be lead to think. 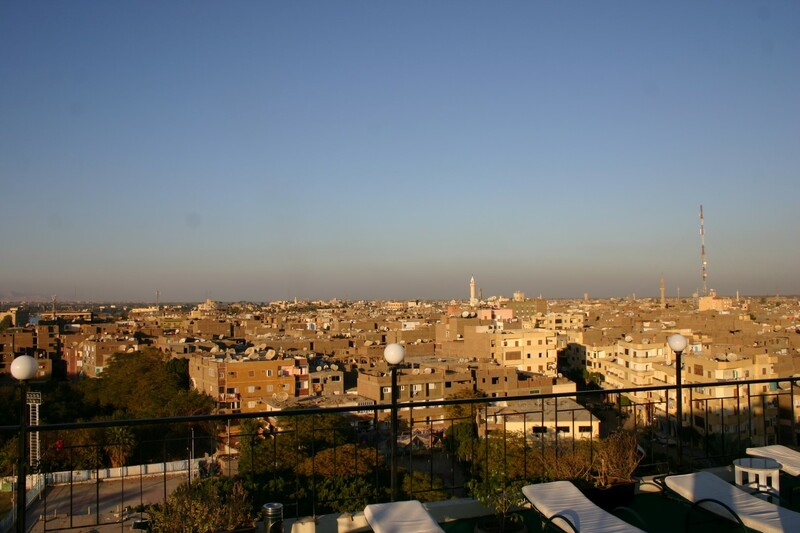 My first memory is of arriving in Cairo late in the evening and driving along the raised highway over the suburbs to a dilapidated, turn of the century, anglicized hotel. Even now it reminds me of hubs made immortal in films from The Mummy, to Gone with The Wind. This felt like a corner of Britain hedged off from the sharp heat of a country that felt (to my inexperienced eye) like the epitome of Arabia. The juxtaposition between the almost Victorian decoration in the lobby to the cacophony of sound and life in the streets remains one of the highlights of my travelling life, and I’ll always have a soft spot for the call to prayer after hearing the dueling sound of the call coming from up to a dozen different mosques around our lodgings. 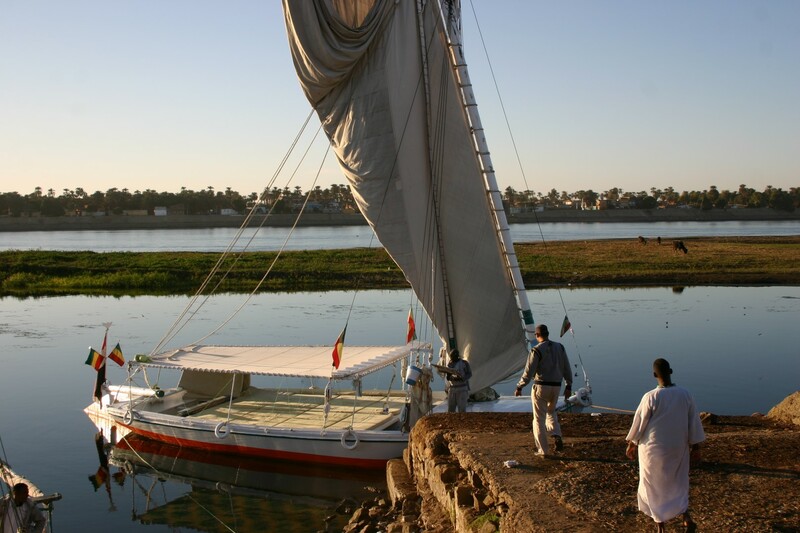 ON THE RIVER: The Felucca where we spent Christmas floating on the Nile. NICE DIGS: Our accommodation for our two day cruise. 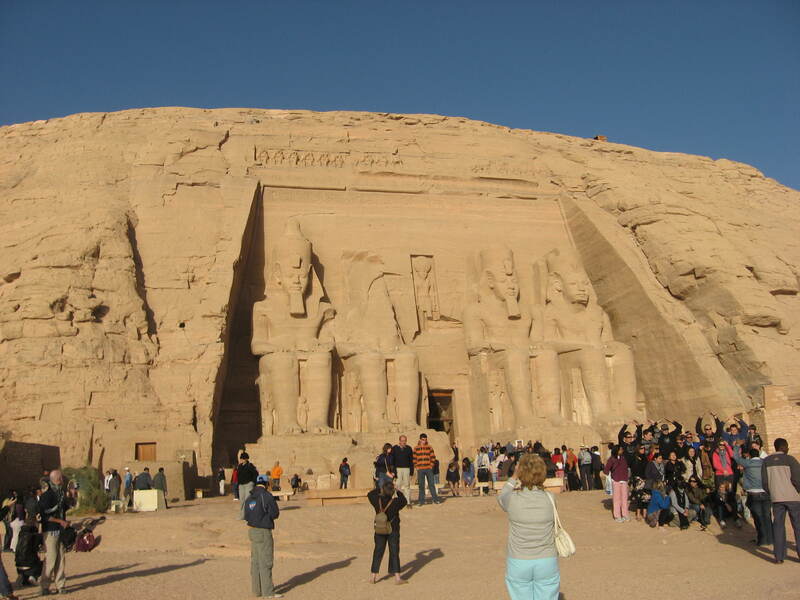 Another glowing memory comes from the banks of the Nile on Christmas Eve. 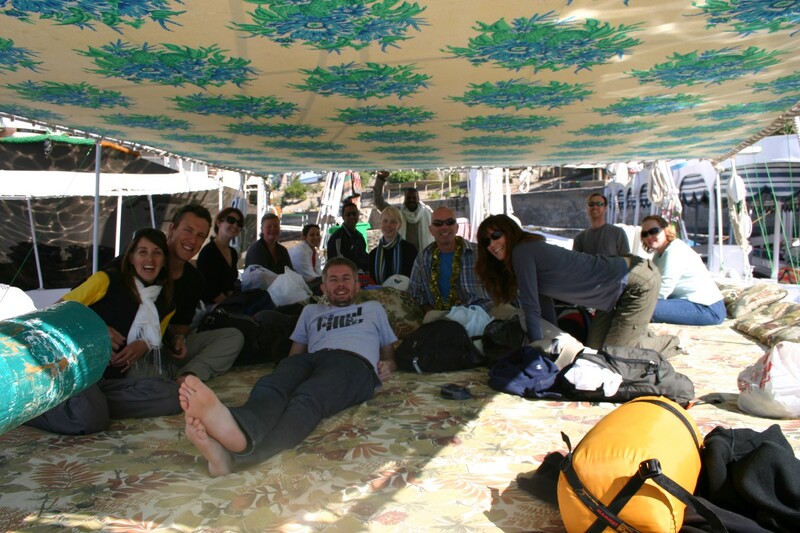 My travelling companion at the time felt quite differently, but for me; camping on a felucca in the chilly December air and sharing an Egyptian feast with our companions was the essence of the kind of travelling I love, and in recent years, miss. 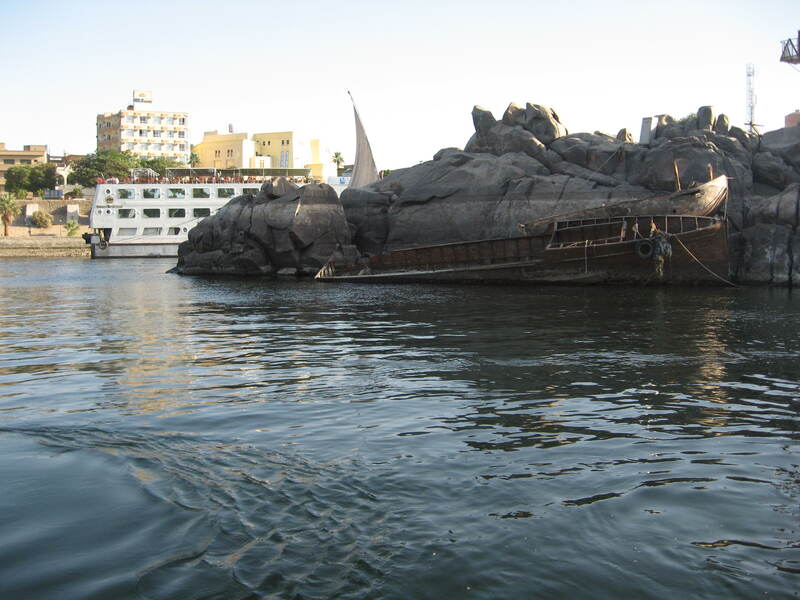 I remember swimming ashore to a covered café decorated with trinkets and icons of Egypt and slowly sipping a drink as the Nile quietly flowed by. 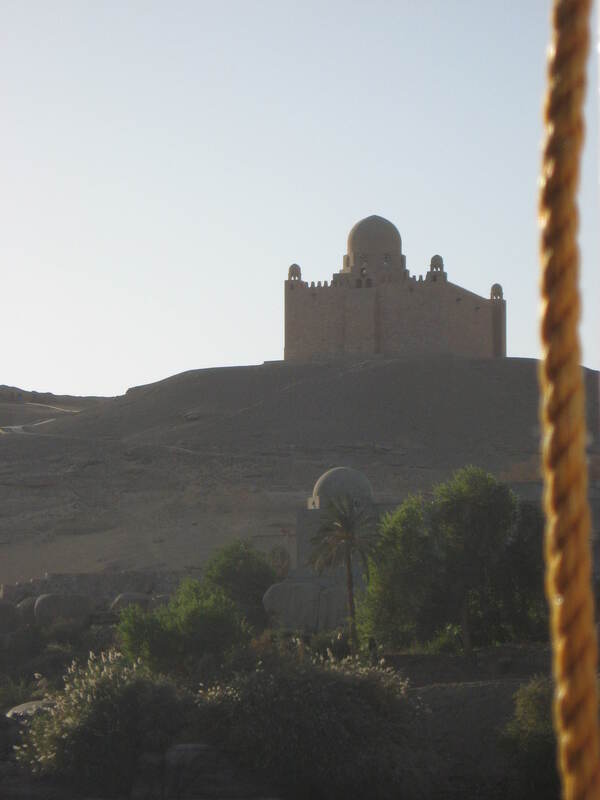 I remember lazing with our party as the felucca rode the wind and the currents down river, and feeling incredibly lucky that I was there, and not cramped on to one of the many paddle steamers that push tourists on the conveyor belt towards the archaeological treasures hidden in Egypt’s interior. I hold dear, my recollection of battling corrupt police at iconic sites like Karnak, where we were fleeced of our tourist dollars under the crumbling columns of some of the world’s oldest architecture, and I still feel the fear as we tried to work out if we were simply being bullied into paying for a photo of if the automatic weapon slung over our assailant’s shoulder would turn into a kidnapping. Similarly, my face still goes red at the idea that I was so systematically stooged into buying a trinket for 50 times its value under the shadow of the Great Pyramid. 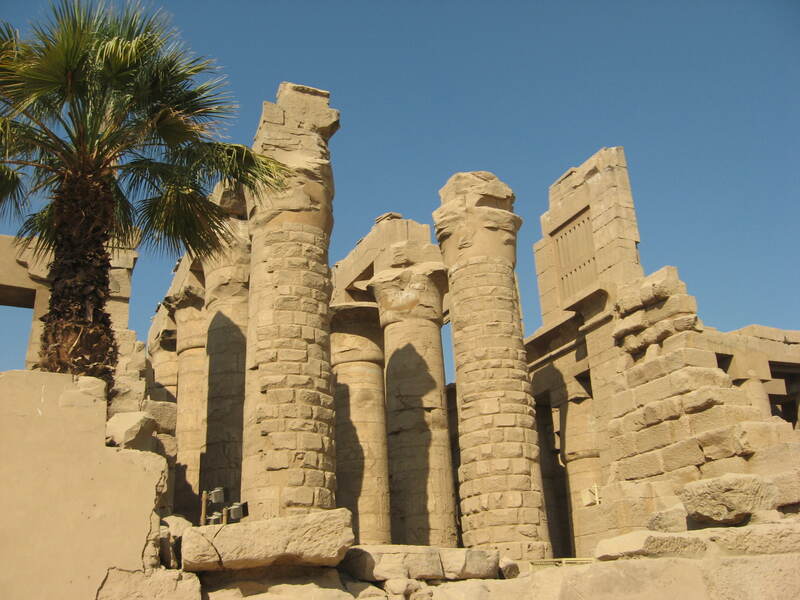 But, walking through Philae Temple, a few miles downstream of the Aswan Dam, I took more joy in wandering through the ruins of history than I did at any other major site before or since. 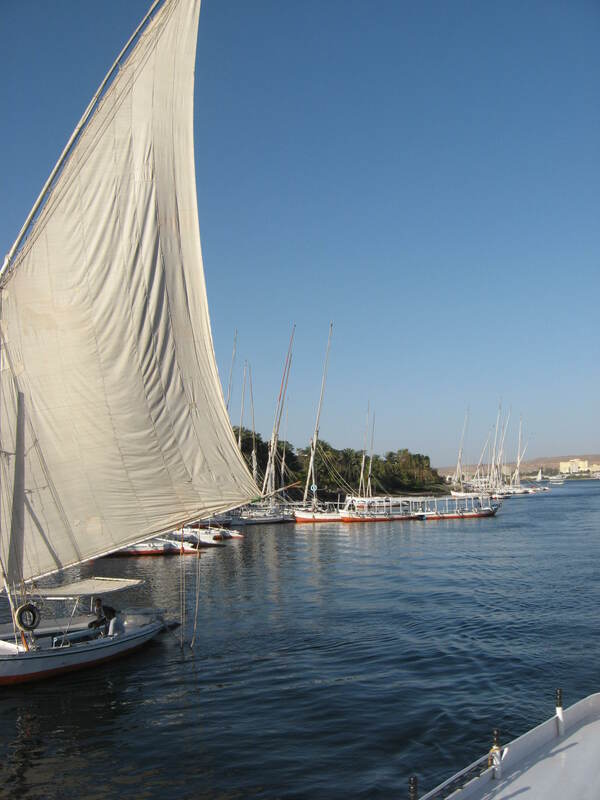 WATERWAY VIEWS: Watching the banks go by from the Nile. 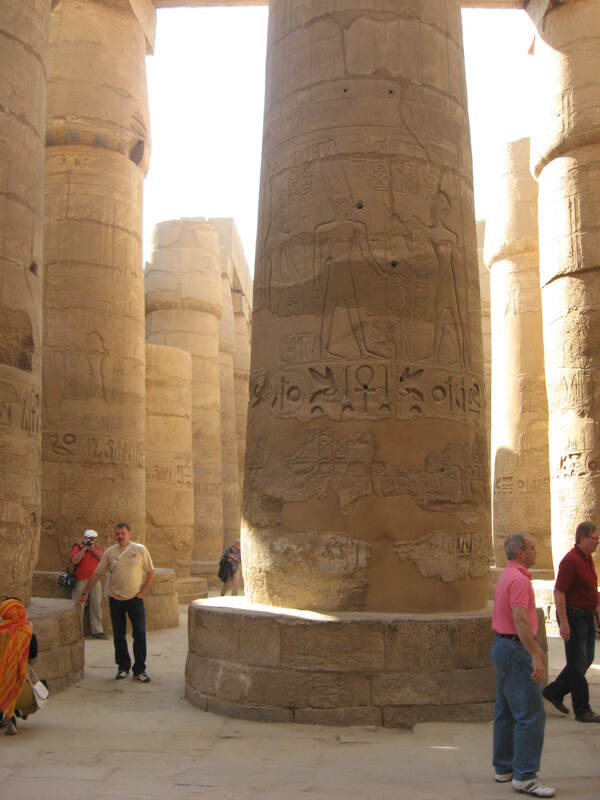 PILLARS FROM THE PAST: Karnak Temple, Luxor where we were bullied by the authorities. 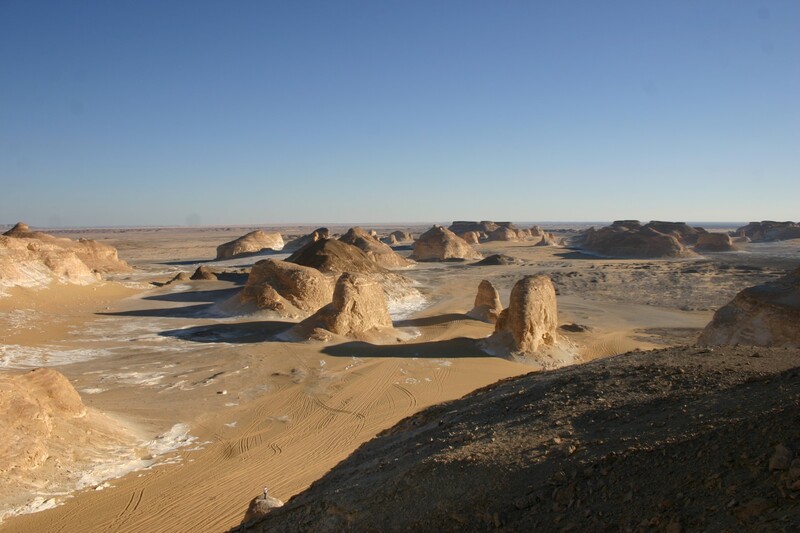 I yearn to return to a desert oasis like Siwa, a border village on Libyan border where it is said that Cleopatra and Alexander the great travelled to consult a great oracle. 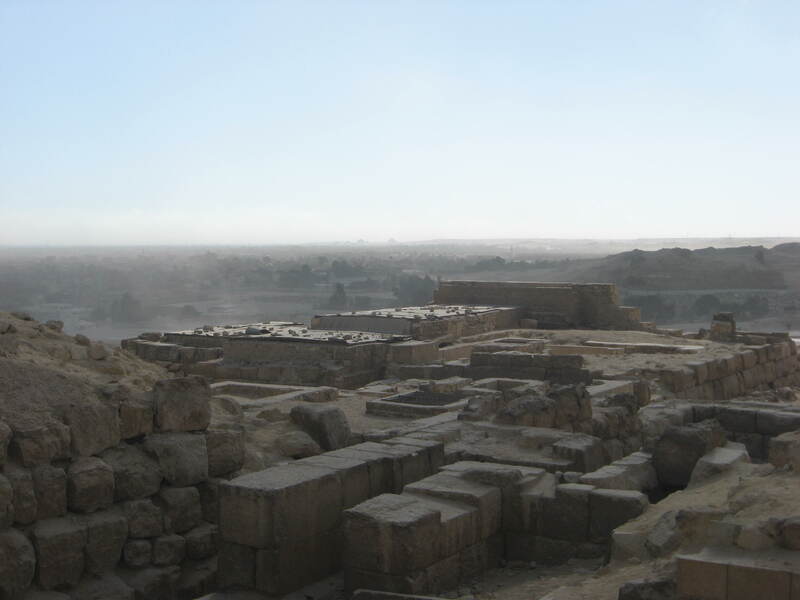 Not much compares to wandering through ruins of a settlement that has been around since the 10th Millennium BC. 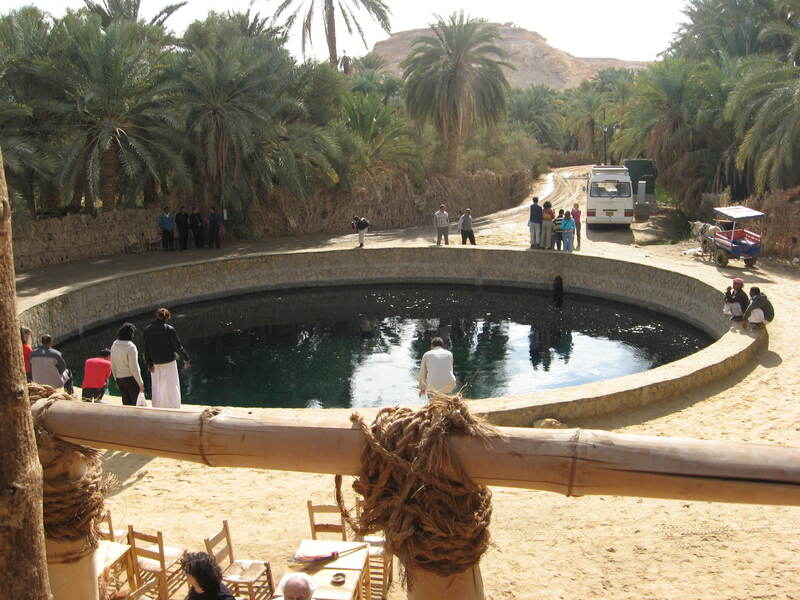 We spent New Years’ Eve in Siwa and swam in a spring that was patronized by Cleopatra, before bringing in the New Year overlooking the ruins of an ancient hill fort around which the existing town is constructed. 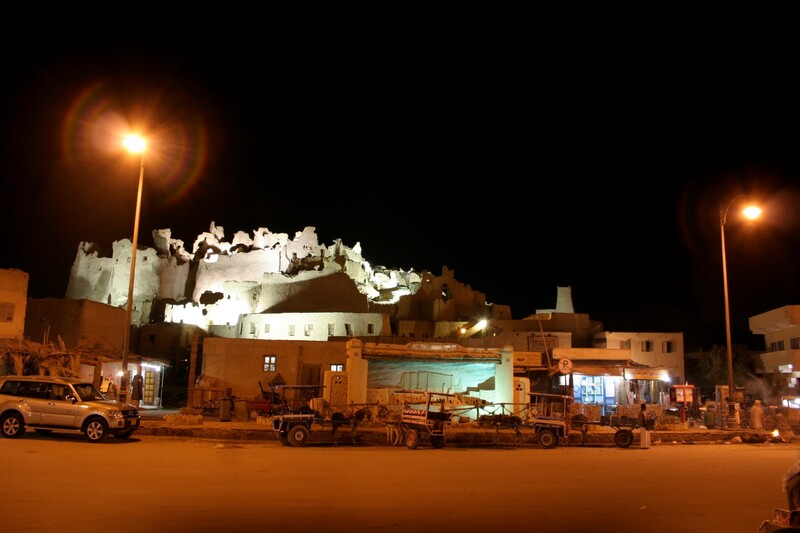 SIWA BY NIGHT: The fort ruins at the centre of Siwa’s town. 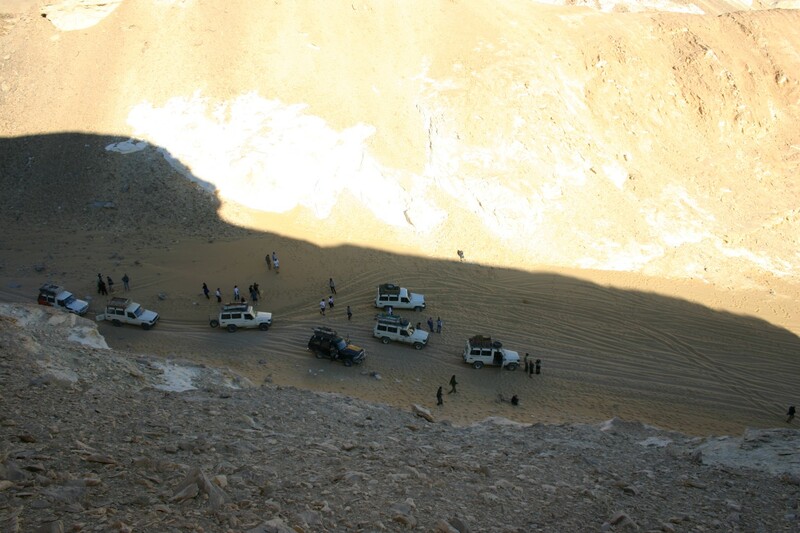 LOOKING DOWN: From the ledge above our ride in the White Desert. 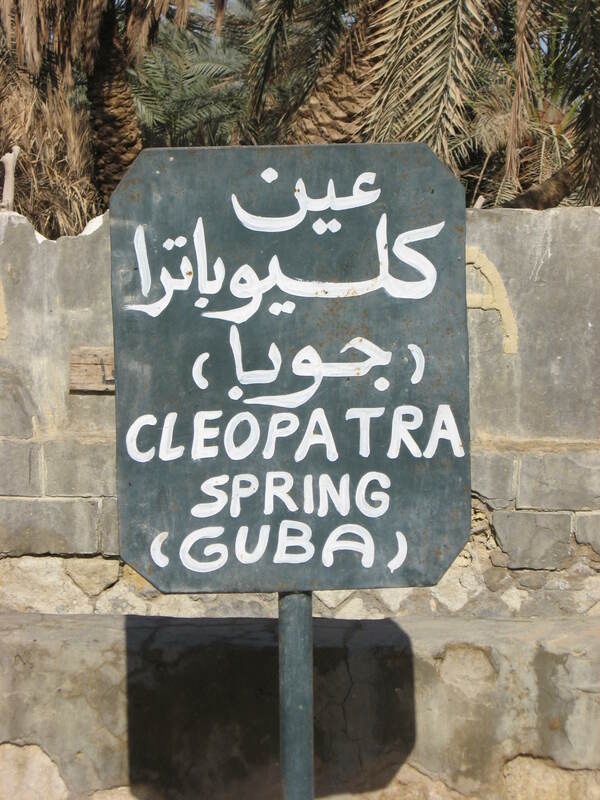 QUEEN’S REST: Cleopatra Spring at Siwa Oasis. 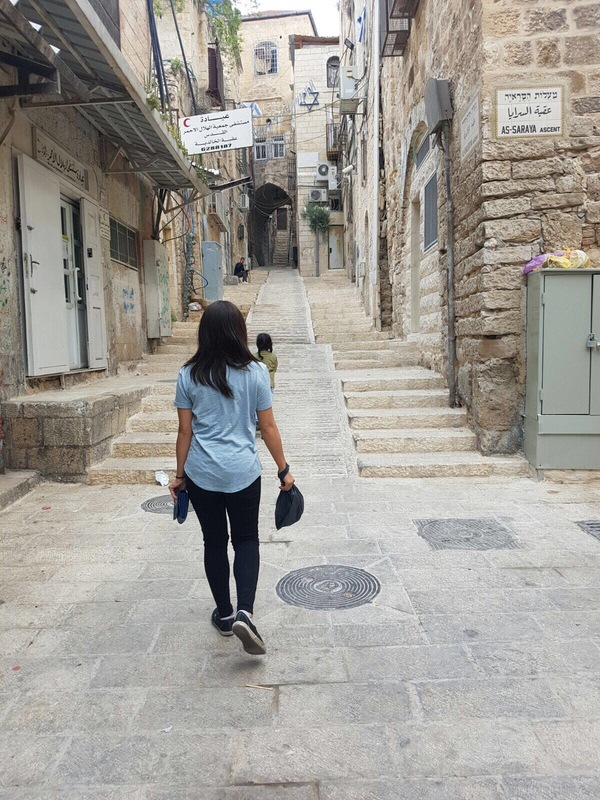 As Linh wanders the ancient cobblestone of Jerusalem and Ramallah, I’m sure she too will be sucked in to the wonder of a region that exudes the vibrancy of history the likes of which, I’ve never felt.